Charming heritage homes, congenial environment, an urban adventure! Accomodating hosts with the inside tips on Toronto, wonderful breakfasts. Beautiful homes and gardens, clean, safe and comfortable. Multicultural neighborhoods, unique and eclectic decor. Central to shopping, theatre, business, arts and historical landmarks. Featured B&B Homes in our Beautiful City! Beachview B&B Beachview B&B Joan's lovely 1920's renovated 2-story home is located in our wonderful Beaches neighbourhood. It is all about location! 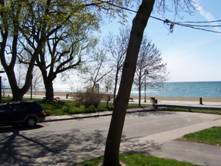 It's on the beach, a 2-minute walk to the streetcar stop, interesting eateries, unique shopping, large parks, miles of boardwalk and much more! The view is magnificent! Only 10 minutes by bus to the Bloor/Main subway station and only 30 minutes by streetcar to downtown. Your host offers a second floor guest apartment that has a covered balcony, sitting area with a gas fireplace, kitchenette, and a private bath. There are two rooms, one with a queen size bed and the other has 2 full size bunk beds and another single which pulls out for a combination of 3 singles, or 1 single and 1 double. Breakfast is either self catered or your host will serve you up a scrumptious meal. The rates range from $120 to $250 per night, including tax, parking on-site, breakfast, internet hook up, laundry facilities. Barb's Queen West B&B Barb and Ed's lovely New York Brownstone town home is nestled in the heart of Queen Street West Village, known for its trendier shopping and cafés. Window-shopping in this area is an interesting experience. Only steps from Spadina and Queen, easy access to public transit, only a 10-minute walk to the Eaton Centre, Sheraton Centre, Convention Centre, Roy Thompson Hall and Royal Alexander and Princess of Wales Theatres. Yes, this is the theatre district! All about location here! Your hosts can be great guides, being city dwellers for many years, they know the city well. Barb offers a wholesome breakfast to suit your tastes. They have two-second floor guest rooms, each with a private bath. One has a double bed with a private bath on a lower level and the other has a double bed and private bath next to the room: Rates range from $80 to $95 per night. Rates include taxes, full breakfast and A/C. Parking is extra in a public parking lot. Danforth's B&B This wonderful renovated Victorian town-home is in the heart of Greektown, known for its ethnic eateries, shops, markets, parks and much more! A very popular neighbourhood for Torontonians! Only steps away from the Chester Subway stop, which connects you to the centre of town in minutes. Your host Joanne offers a home full of Central American art pieces, bright colours and wonderful space to relax in. She offers 2 second-floor guestrooms, both with a queen bed, sitting area next to the rooms and a shared bath. There is also a spacious balcony off one of the rooms. Enjoy your morning coffee out in the back garden! Rates range from $85 to $105 per night. These rates include taxes, A/C, parking on premises, and a hearty breakfast. Rheas' B&B at the Top of Toronto Rheas' two-story home is located uptown in our North York neighbourhood, on a quiet col-de-sac. Her home is a 10-minute walk to the Sheppard and Yonge subway station, which gets you downtown within 20-minutes. 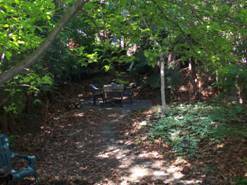 This is a suburban oasis, with nature trails at her doorstep, and for the more energetic there is a golf course less than 5 minutes away. For the guests who have a car, the nearby highway makes it easy access to the Metro Zoo, Canada's Wonderland, the Science Centre, and for the business travelers who need to be in different parts of the city. Rhea offers two guest rooms, one with a double and the other is a set of twin beds, which share a common bath. Rates range from $60 to $75 per night, which include tax, full breakfast, A/C and parking on-site. Caroline's B&B Caroline's elegant condominium is truly in the heart of the city. Location, location, location! Looking out over the city from the 26th floor, "A B&B in the sky". 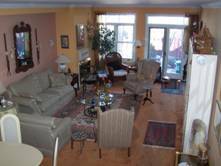 Walking distance to Yonge and Bloor, Bay and Bloor subway stations. The centre for shops and restaurants. A minutes walk to the University of Toronto, Yorkville Shopping where who's who like to shop, Royal Ontario Museum and much more! Caroline loves to cook and puts on a tasty gourmet breakfast for you. Your hostess is an actress and singer and knows all about our lovely city. She offers a queen size bed guest room and private bath, with an elegant decor throughout. This is a great spot for single women and couples traveling. Rates range from $140 to $155. These rates include a full breakfast and A/C. Parking is extra for approx. $15 for a 24-hour period. Marlay House B&B This beautiful renovated Edwardian home is in the heart of the Annex neighborhood with so much to offer. Only a three minutes walk to the Dupont subway, restaurants and cafes, Yorkville shopping and Art galleries, University of Toronto, Royal Ontario Museum, Casa Loma and much, much more! Built in 1899, its original stain glass, woodwork, and wonderful antiques throughout create an elegant Victorian, yet comfortable and relaxed atmosphere. It is a favourite with musicians, artists and academics. An extended continental breakfast is offered on a spacious deck off the second floor with a guest kitchen. 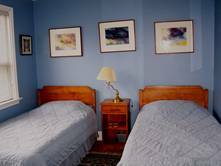 The second floor has a bright 2-twin-bed guestroom and queen-size four poster bed guestroom, each with wash-hand basin, and each share a common full bath with shower. There are two third floor guestrooms with ensuite baths, with a queen bed or double bed. Rates range from $85 to $110 per night, which include tax, a hearty continental breakfast, TV in each room, and window A/C. 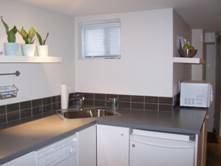 Limited on site parking and ample street parking both day and night. Greektowns Get Away This unhosted lower level unit is in the heart of our Danforth neighbourhood, known for its ethnic eateries, shops, markets, parks and much more! If privacy is what you want, this is the place for you. Modernly decorated, bright and cheerful! Only steps to the Pape/Danforth subway station, and then you can go anywhere in the city within minutes. 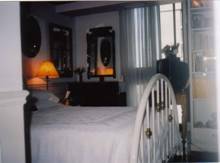 Karen, the B&B unit owner, offers a spacious kitchen, private full bath, private entrance, sitting area with TV, queen size bed in bedroom and laundry facilities. 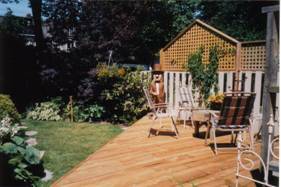 There is also a lovely back garden to sit in to enjoy the bright mornings or calm evenings! The rates range from $100 to $140, which include tax, internet hook-up, phone line and A/C. Parking is in a public parking lot 2 doors away, $6 during the day and $4 overnight. Nhida's West B&B Nida's town home is in the west side of the city, close to High Park, CNE grounds, Ontario Place and easy access to anywhere in the city. Only a 2-minute walk to the Dundas West subway stop, and 20 minutes by subway to downtown. There are local eateries, and shops to stroll to. Nida offers 3 immaculate guestrooms on the second floor of her home. Simple and clean, 2 have a single bed and one has a set of twin beds. These rooms share a full bath. 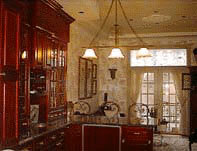 There is a kitchenette to store snacks and drinks. There is a TV in the kitchen, so while you have your coffee you can catch the news or sit out on the deck for fresh air. This is a perfect B&B for the budget minded that don't mind being a little further out of the downtown area, but still easy access to anywhere in the city. Rates range from $55 to $70 per night. These rates include tax, self-serve hearty continental breakfast and parking across the street at the local grocery store and A/C. 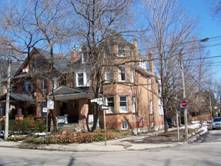 Centre of Toronto Bed and Breakfast Centre of Toronto Bed and Breakfast, located in the centre of our beautiful city, minutes walk to the Chester subway stop, and to many many interesting restaurants and much more! Only minutes by transit to the Ontario Museum, Yorkville shopping, Casa Loma, CN Tower and all other sites. Your host, Mary offers you two lovely guestrooms in her Toronto city home. Both rooms have queen beds, which share a common bath. Also one of the rooms has a balcony. Rates from $85 - $110, which include tax, breakfast, A/C and parking. On the Westside B&B a stunning three story townhome, in the west end of the city. Only a 2 minute walk to the Ossington bus and a 5 minute ride down to the Ossington and Bloor subway stop. Easy access to Ontario Place and the CNE grounds. 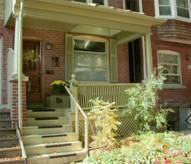 Minutes to our High Park area that has great eateries and shopping. To the center of town, (Yonge and Bloor), you are only 6 stops away! Also walking distance to some local restaurants and shopping. This home features modern décor and comfortable surroundings. 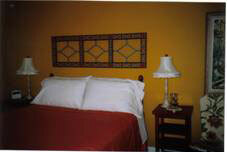 Your hosts, offer you a third floor walk up to a twin/king bed guestroom, which ever you prefer, and a private bath. Rates from $65. to $75. These rates include tax, extended continental breakfast, A/C and if parking is needed, please advise us, an extra charge of $10 per night will apply for street parking, which your hosts will provide. The Secret Garden this lovely B&B home is in the heart of our popular neighbourhood known as the Annex, only a minutes walk to the Bloor St, and two main subway stops, Bathurst and Spadina. Minutes to the University, Royal Ontario Museum, International dining, shopping, strolling and much more! Your host, believes in treating the environment gently and strives to serve you only organic, locally grown produce, and only uses environmentally-friendly cleaning products for cleaning. There is a lovely second floor, queen size bed guestroom with ensuite, with antique tub/shower, private balcony overlooking the back garden! Awesome retreat! Upon request there is a TV and DVD available. Rates range from $100. to $130. These rates include tax, full breakfast, air-conditioning, high speed internet and parking on site for a mid size vehicle. Markham House B&B located in the heart of Seaton Village, next to our Annex neighbourhood, known for its wonderful restaurants, unique shopping and much more ! Only a 5 minute walk to the Bathurst and Bloor subway stop, which connects you to anywhere in the city in minutes.. Easy transit to the University of Toronto, Royal Ontario Museum, Casa Loma, and the CNE grounds, if you are coming in for a trade show. 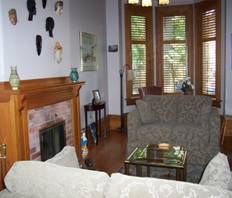 Your host offers a lovely renovated two storey Victorian home. The Seaton Victorian Dream Located in our downtown neighbourhood, Cabbagetown, known for its grand Victorian homes built in the 1800's. This home is a beauty, with original pine mouldings, high ceilings, stained glass windows and the warmth of the 1800's. 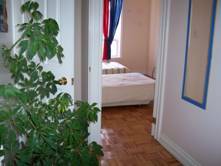 Only a 10 minute walk to the Eaton Centre, Canon Theatre, local restaurants and much more! And only a 25 minute walk to the Metro Convention Centre, SkyDome, Queen West Village and CN Tower. Joan, your hostess offers two guestrooms on the second floor, both with ensuite baths. The first of the two rooms has a double bed, and the ensuite has a sunken spa tub with a separate shower. The second room has a double pull out sofa-bed, fireplace, TV and a wonderful bay window. The ensuite has a tub/shower unit. Rates range from $70 - $110. 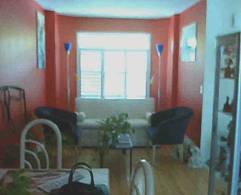 Both rooms share a spacious back sun deck and office area. The rates above include tax, extended continental breakfast, A/C, high speed internet and parking on site. For more information about these and other B&B homes, please Contact Us, and we will be pleased to send you a list of B&B's that are available and that suit your needs!